White pumpkins are new to me since living in Minnesota. I never saw a white pumpkin growing up in Indiana, and they definitely weren’t in Florida. 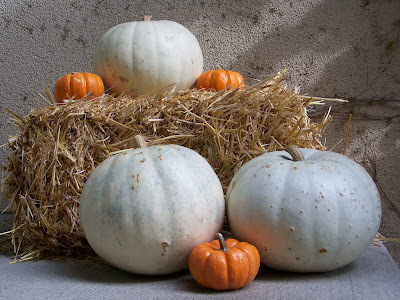 In fact pumpkins cost $10 for a big one in Florida…here in Minnesota you might only pay $3 for the same size. So this year I decided to try the white ones. They look pretty nice. South of the Twin Cities, there are numerous pumpkin farms. It is amazing to drive for a quarter mile and see rows and rows of pumpkins…even weirder when it is only the white ones. I thought about drawing on them like Martha Stewart suggests, but they look so good plain I just couldn’t‘ bring myself to deface them.